As the gift giving season winds down I still have a few names on my list for whom I find it difficult if not almost impossible to buy a gift. Gift cards are always a good choice and incredibly green if chosen from the right store and bought and delivered online. But, I’m getting a little bored with sending the same few people the same few gift cards each year. I’d like to try something new. And, it’s getting late, which means my options are limited. One of the challenges that I face is buying green gifts for those who are not necessarily green. Those semi-green or “would like to be green” see me as green and expect a green gift. They however expect it to be something after that after thanking me profusely and commenting on my creativity, they can return to a site or store with which they are familiar. This can be a bit of a challenge. However, since the organic food movement seems to have gone main stream, this has become less difficult. Most of the folks on my list appreciate an organic goodie and now I’ve found it’s easy to give one. The folks at 1-800- Flowers, now offer a selection of organic gift baskets. The Ultimate Gourmet Sampler comes in a natural flax basket filled with a variety of tasty organic cookies, pretzels and crackers. The Treelela Organic Tea Sampler features tins filled with a nice selection of organic teas. My favorite though is the simplest. 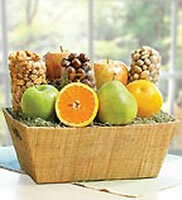 The Organic Fruit and Nut Tower features an assortment of organic fruits and nuts packaged in reusable flax trays. This seems to be a gift sure to please just about anyone on my list. Since these are offered by one of the largest companies specializing in this type of delivery, I feel confident my gift will arrive by Christmas…even if I stall another day or so.